Meet Einstein our fun loving fur boy who enjoys long walks, games of catch, tasty treats and snuggling by the fire. He earned his prestigious name after being adopted from a shelter in Tuscaloosa Alabama when my son attended the University of Alabama there. He spent his early years learning all about campus life. Einstein is always up for a PetSmart review! This year PetSmart's Halloween Shop is filled with famous lines like Disney, Martha Stewart, Bret Michaels and more, so you can find the perfect costume to match your pet’s personality this holiday! 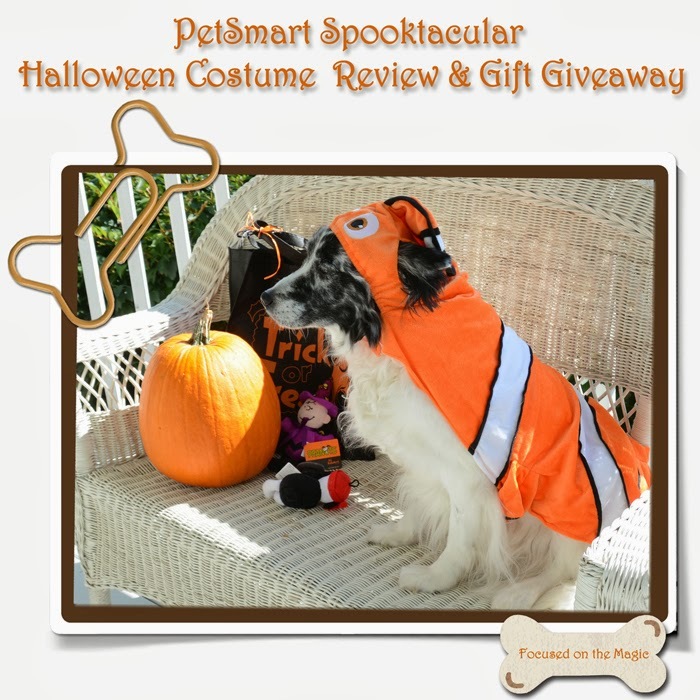 Whether you are a Nemo fan, an Elmo lover or up for a glowing good time, we’re sure that you can find a costume that you and your pet love! As you can see from the pictures, Einstein looks spooktacular in a dashing Disney Nemo costume. It comes with a hood attached with openings for your dogs ears, velcro fasteners at the neck and tummy and feels oh so soft. The look is made complete with fins and a fin tail all made of a cuddly stretchy material. Perfect for a Halloween night out on the town trick or treating. Einstein is ready for our village Halloween parade and visit to PetSmart for treats. Halloween treats are a must for Einstein. I usually bake up homemade biscuits for his neighborhood fur friends but I may pass on it this year because he loved gobbling up the Blue, Boo Bars. I feel good about giving them to him because they are all natural dog biscuits baked with pumpkin and cinnamon and filled with whole grains fruits and veggies. He loved them! Einstein loves his toys and had a fun time playing with Snoopy the Pirate and Charlie Brown the Wizard. He even had Charlie Brown the Wizard flying by tossing him the air! Be sure to keep an eye on the Petsmart Facebook Deals page for the most savings and sales offers! 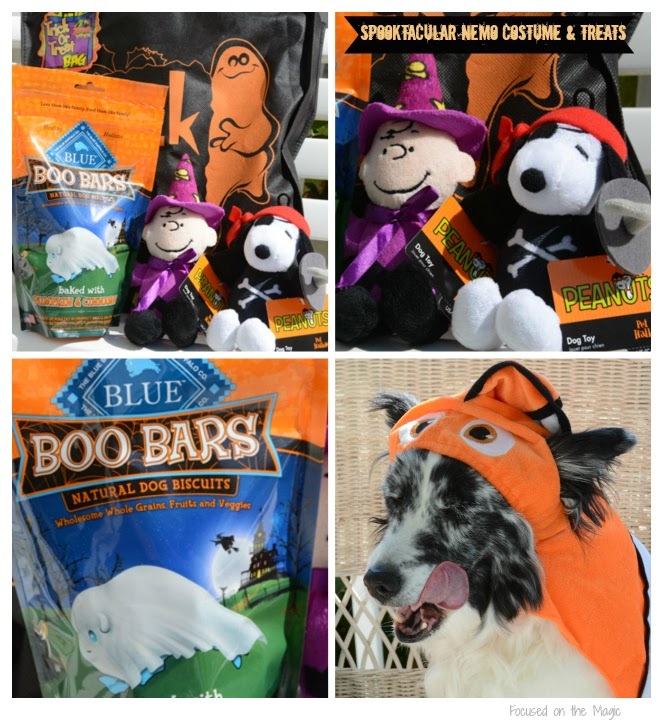 And don’t forget the scary fun events PetSmart has in store for you! On October 19 – PetSmart is hosting in-store events where pet parents across the nation are invited to join in on some costume fun. Check out the Costume Machine where you can style your pet a spooky new look. The winner will be drawn by Rafflecopter. Once verified the winner will be notified by email. The winner has 48 hours to reply or another winner will be chosen. Giveaway begins Now and runs through October 10th at 11:59PM US Eastern time. It is open to residents of the US only, 18+. Use the Rafflecopter form below to enter, and be sure to take advantage of the many entries you can gain. Come back daily for even more chances to win. Good Luck! !